Extract from Turton Workhouse by David J. Leeming, pages 25-27, Chapter 3. The Poor Law in Turton c1730-1829. Around 1736 Samuel Chetham, great nephew of Humphrey, gave an estate called Goose Cote Hill in the township of Turton to trustees for a term of 3 lives or 31 years. The rents were to be used for the benefit of the poor of Turton. The land included a farmhouse which had the potential to become the nucleus of a workhouse. A 1746 Survey valued the estate £4-10s-0d pa for the farmhouse, two pastured fields, a corn field, two other fields and 3 little meadows. By Indentures of Lease and Release dated 1st and 2nd June 1748 Humphrey Chetham (brother of Samuel) left the Goose Cote Hill land and buildings in perpetuity to the township of Turton. The estate was conveyed to trustees John Wilson and John Lomax and their heirs in consideration of the trust that Chetham had in them. The estate consisted of a messuage and tenement (farmhouse with outbuildings and land), with a cottage, garden, and enclosed fields etc. The enclosed fields were known by the names, Nearer and Further Barn Field, Rough Field, Furthermost Field, Great Field, Meadow under the House, Middlemost and Furthermost Meadows, and Fold, comprising about 8 Cheshire Acres of land. The inhabitants of Turton built an extension on the farmhouse to act as a workhouse to house around 60 people. The cost was £64-7s-9d besides gift work. 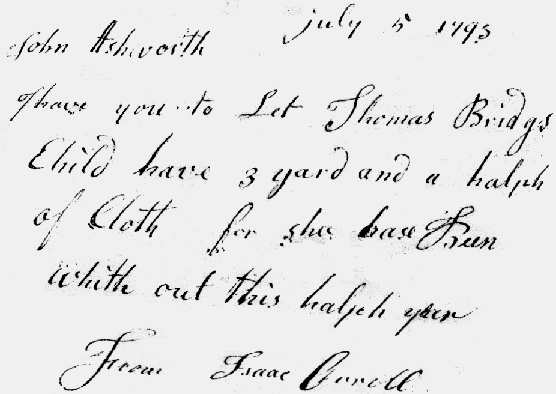 John Wood and John Orrell paid £20-0s-0d from the local rates and Samuel Holt, Overseer of the Poor, laid out £39-3s-0½d from the townships’s money. The rents and profits were to be used for the support of poor people living or legally settled in Turton, whether already relieved by public assessment or not; relief to be given as the trustees should think fit. One month later, by an indenture deed of 1 July 1748, John Wilson and John Lomax conveyed the estate to John Nuttall, John Orrell and John Wood who became the new trustees. The conveyance included an agreement to dispose of the rents and profits for the relief of the poor people of the township, in accordance with the wishes of the testator. Some of the rents and profits were spent by the trustees in the purchase of clothing for the poor and the families of many deserving and industrious people who were struggling to sustain themselves above the level of pauperism. The 1748 Indenture required that the trustees should meet twice a year in the Chapel of Turton or elsewhere, on Whit Monday and the first Monday after Christmas, for transacting necessary business as well as to elect poor people to receive the Charity. All transactions were entered in a book kept for the purpose. It was also agreed that whenever the number of trustees should fall to two, the two survivors would nominate others to make up their total number into four. Newly elected trustees had to reside and be legally settled in the manor, and the sitting survivors conveyed the premises to both the use of themselves and the new trustees. A further development occurred in 1781 when a Memorandum of Agreement was made between John Wood and John Orrell, trustees and Samuel Holt, Overseer of the Poor, together with some of the principal inhabitants assembled at a Town Meeting held at Chapeltown on 7 Aug 1781. The Memorandum was worded: Whereas a house was built last year (1780) at the north-east end of Goose Cote Hill Barn at the expense of Samuel Holt, Overseer of the Poor, on behalf of the landowners of the township of Turton, and John Wood and John Orrell, trustees for that estate, called Goose Cote Hill, first given by Samuel Chetham for 3 lives or 31 years, and then after given by Humphrey Chetham, land forever to be disposed of by the trustees, according to the conditions mentioned in the original deeds, to the poor of the township of Turton. The house at the end of the barn was seemingly to be a series of cottages with loomshops for use by the poor. The intention of the 1781 meeting was that John Wood, John Orrell and others should have the new building at the north-east end of the barn as a house within the estate forever, the proceeds to be used to provide cloth for the poor. The township churchwardens, overseers of the poor, and others had the benefit of the older buildings built in 1748 together with the original adjoining farmhouse and adjacent road, fold, coal house, little house and garden. This with extensions, was to be expanded into a ‘house of industry’ (workhouse) administered by church wardens and overseers; Wood and Orrell giving up all control. 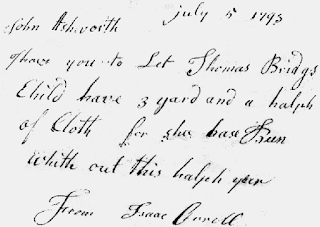 A further change occurred in 1786 when by an Indenture of July 19 1786, trustees John Orrell and John Wood conveyed their premises (the barn and new house) to Isaac Orrell (son of John Orrell) and John Ashworth (son of Henry Ashworth) as their successors, who became the trustees in office. The original farmhouse and extensions were in the tenancy of a Richard Isherwood during 1792/93. A letter dated 7 December 1793 signed by John Howarth as agent for the landlords, gave notice to Isherwood to remove and quit as he was overholding the buildings and land, and would have to pay double the yearly value after the date of the notice. This was a time when great panic occurred and the rates in Turton were 10 shillings in the pound. Economic conditions were poor; bad harvests and turmoil in Europe caused a loss of overseas markets which resulted in high food prices and little work. Unemployment was high and many were thrust into the house which was inhabited by some of the worst of characters. An ‘Account Book’ of 1794 shows how the income was collected. It was kept by the trustees, Isaac Orrell and John Ashworth for an ‘aforesaid pious use’. The money collected became known as the Humphrey Chetham Charity (HCC) and provided cloth and bed linen to help the poor and elderly people who were not actually paupers dependent on the township.